Fabric Design Weekend Was So. Much. Fun. For reals. 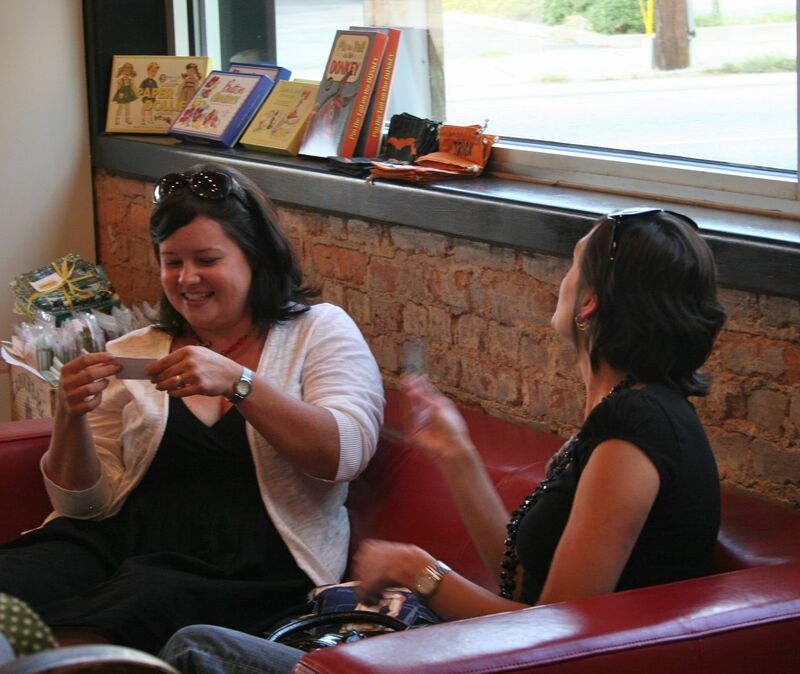 I admitted it this weekend in person, so I might as well admit it to you here: I host these sorts of events because I want to go to them, and I’m just inviting other people along so I can more easily justify my addiction. There. It’s out now. You know the truth. I couldn’t have asked for three more lovely and delightful, talented and funny women to come to the shop and talk about fabric design. It was hugely entertaining and I learned a TON. I gotta hand it to the audience on Saturday, too: the questions that were posed for the designers were excellent, and the symbiosis between the panel and the audience was amazing. But I get ahead of myself. 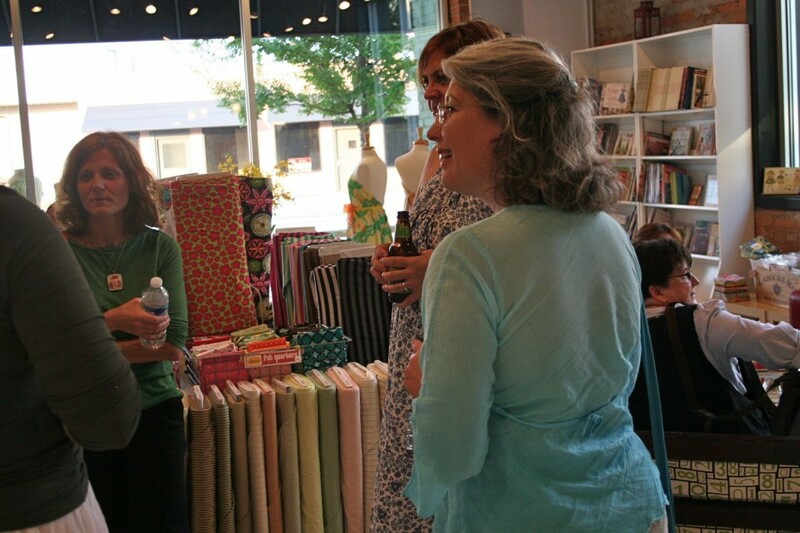 Friday night began with a meet and greet featuring our three designers: Melody Miller of Ruby Star Rising, who has a line coming out with Kokka this fall; Rashida Coleman-Hale of I (Heart) Linen, who has a line with Timeless Treasures coming out next spring; and Ellen Baker of The Long Thread, who has featured many of her fabric design projects–from block printing to Spoonflower–on her blog. It was nice and relaxed, and a very cool chance to get to have in-depth conversations with these ladies and ask questions that the panel discussion really didn’t allow room for. 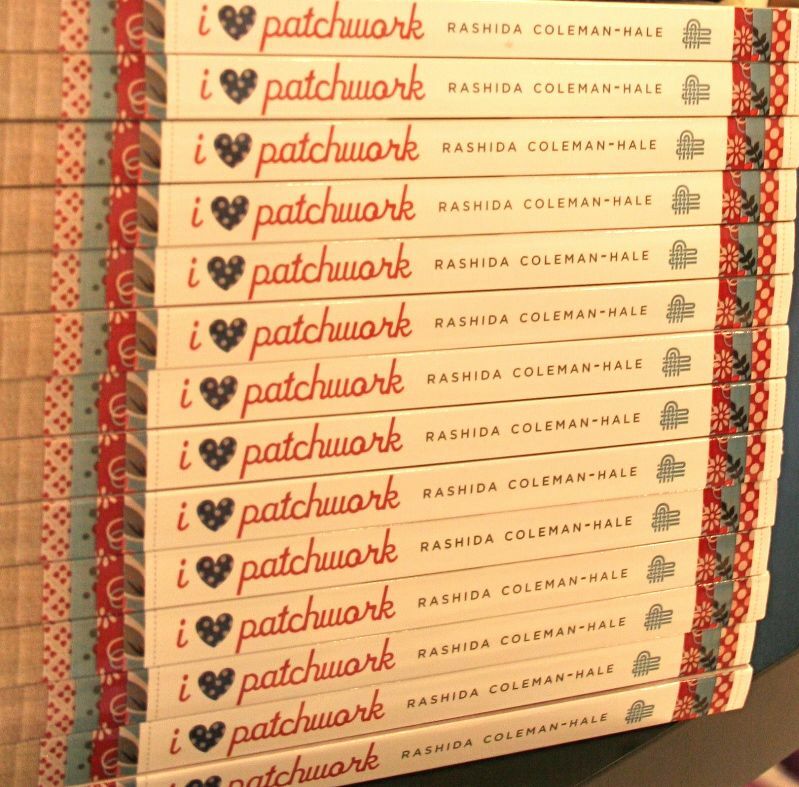 Rashida was generous enough to sign some copies of her book–if you weren’t fortunate enough to meet her this past weekend, do yourself a favor and come grab a copy of your book. It’s really excellent, and autographed! I loved meeting all the folks who drove down and hearing their stories, and how excited we all were to be geeking out on fabric together. Happy Friday night. 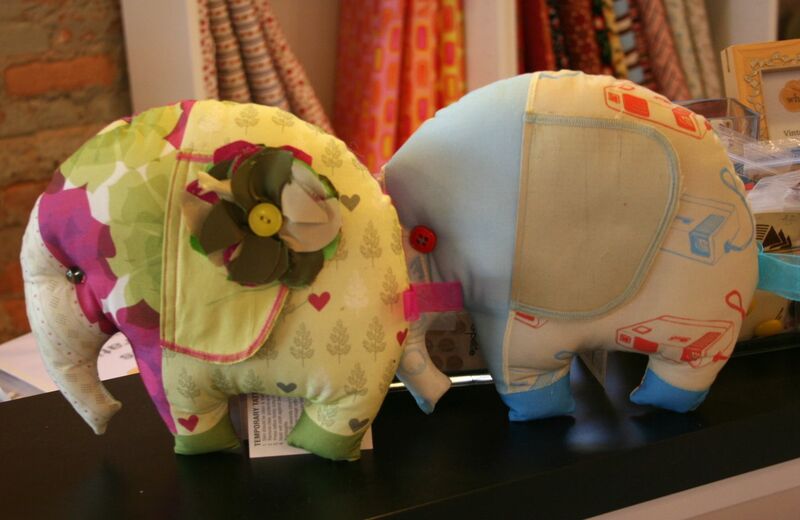 We also did a giveaway for a bundle of fabric from these designers, including these precious tooth fairy pillows made from Melody’s upcoming line. 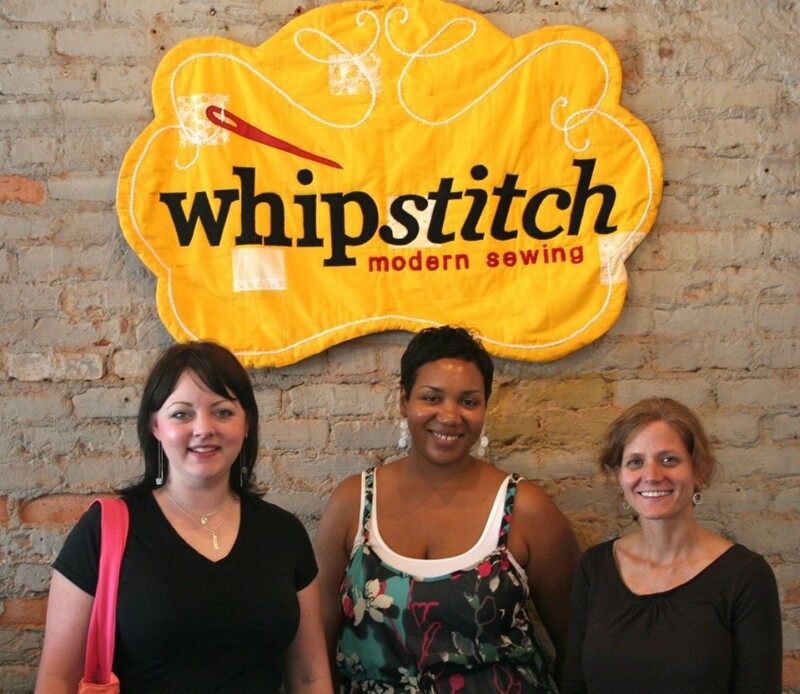 I had a conversation with Melody afterward, actually, about my vision for Whipstitch, and my hope that it will become a gathering point for sewing types in Atlanta. We don’t have a central place where the community can really reliably gather, and that’s such a big deal to me–seeing this event unfold gave me a glimpse into what it looks like to have a community of stitchers really come together and exchange ideas and play together. It was super cool. Saturday was the panel discussion. 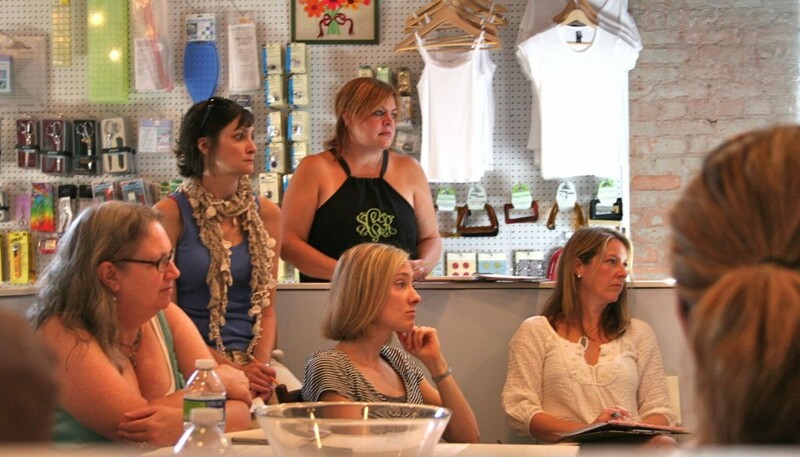 I wasn’t really sure what questions I wanted answered or what I hoped to hear–I just knew I wanted to hear these smart ladies share their ideas and experiences when it comes to fabric design and the process of developing a collection of fabrics and how to get that printed and out into the world. It was so perfect, really. 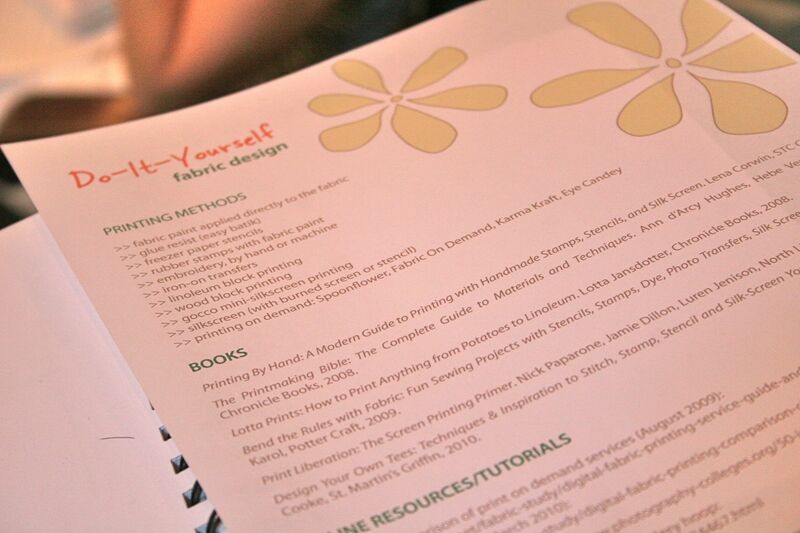 Ellen brought a fantastic handout to accompany the points she made about printing our own fabric–she called it geeky, but at Whipstitch, we speak fluent geek. I thought it was awesome. 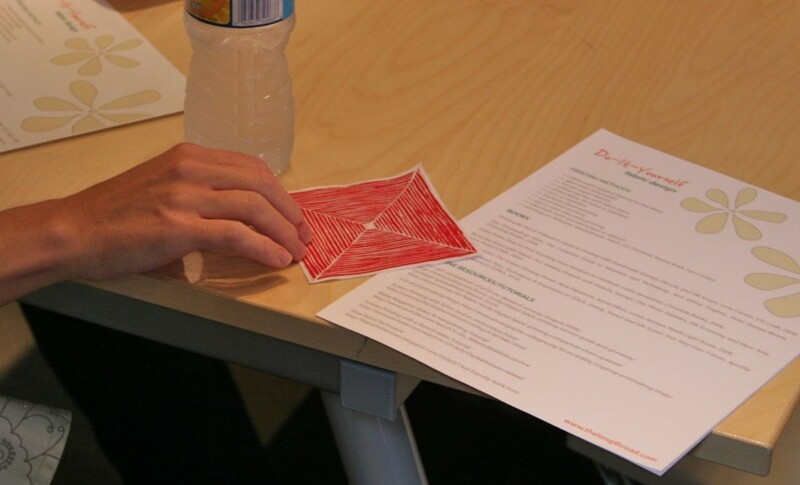 She’s also added some notes on her blog that are wonderfully useful. Actually, most of the participants took notes, and I’m hoping to steal some of them (any of you want to scan your notes to share? Would love to see what you wrote down!). 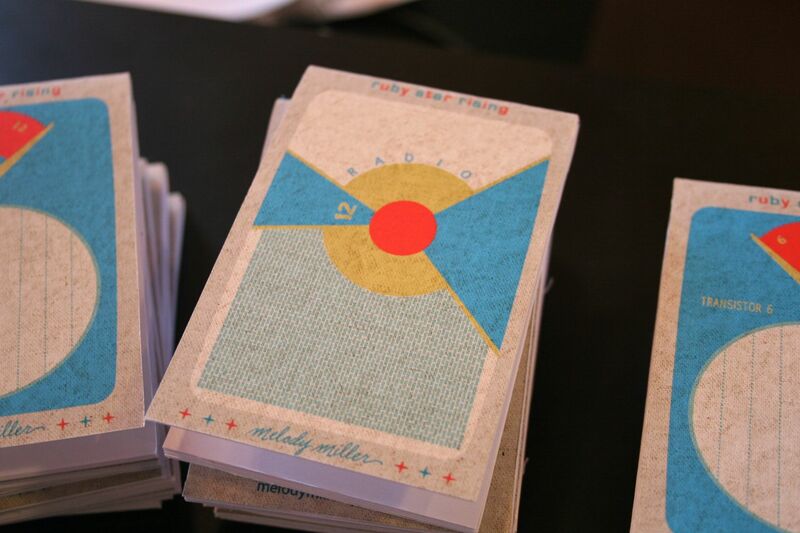 Luckily, Melody printed up some notepads featuring one of the designs from her collection! Hearing about the differences in production between Kokka and Timeless Treasures, and comparing those to Spoonflower or Karma Kraft, was really fascinating. I’ve toyed with the idea of having some fabrics printed up, but there are so many issues to think through that I’ve never thought of. I loved hearing each of the designers talk about how their own artistic vision translates to something that is to be sold at volume, like fabric, and how that is affected by working with a manufacturer. 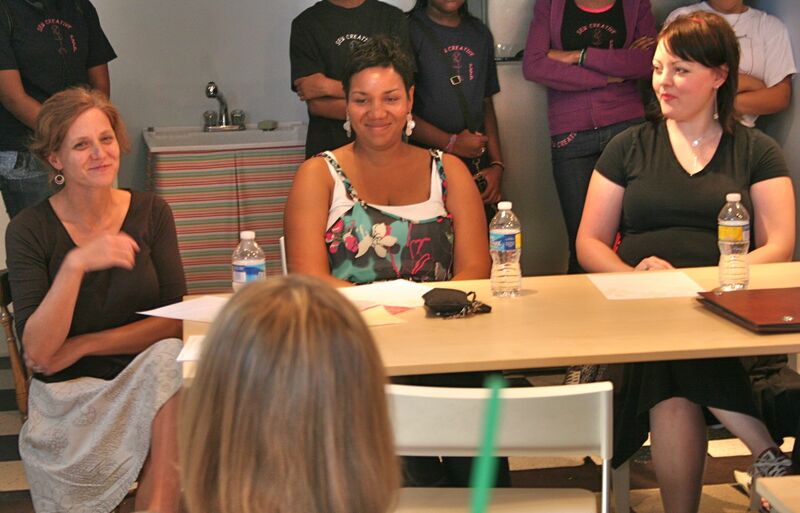 I loved hearing Rashida and Melody’s stories of how their lines were picked up and developed over time. It was amazing to think about all the many, many ways fabric can be made–I get so caught up in the excitement of digital printing through Spoonflower that I forget we can batik or Gocco or block print, too. 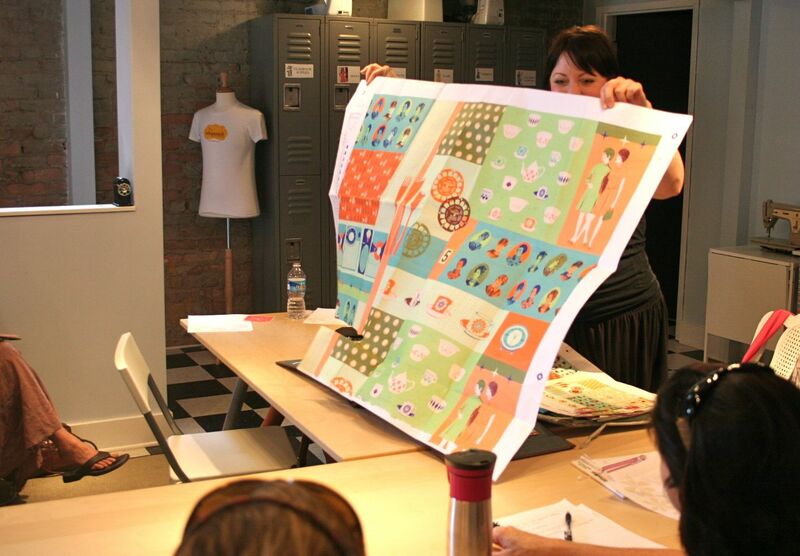 I loved seeing samples of different types of fabric printing, like the ones that Ellen brought, or of fabric at different stages in the process, like the pieces Melody had back from her manufacturer. Thinking about scale and pattern repeats and how to make cohesive coordinates gave us all plenty of mental candy for the day. Huge thanks to these lovely ladies for a very cool event, a very thought-provoking discussion, and for giving us all some fabric dreams to take home with us! ← Stitch By Stitch Blog Tour! oh man, what a cool event! really wish I could have been there to learn from those talented ladies! Another time…. I’m so happy your shop is becoming a hub. It’s really the perfect environment. So comfortable, hip, casual, welcoming, and such a great variety of prints. oh that looks awesome. TOTALLY wishing I had been there!! !